Dental implants are a routine part of modern dentistry – no longer considered "experimental" or even "new." The have revolutionized dentistry, and now they are tried and true. Studies have found that the success rate for today's dental implants is as high as 98 percent, with no or little discernable bone loss. In the hands of a properly trained and skilled specialized dentist they are a safe, predictable and most often preferred alternative to old-fashioned bridges and dentures. Placed in your jawbone, the implant (a titanium screw post) replaces the root of the missing tooth and fuses with the bone in a process called "osseointegration." 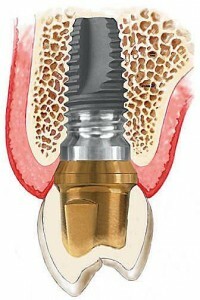 The implant is then fitted with a replacement tooth. Multiple implants can also be used to support a permanent bridge (replacing several missing teeth) which is cemented or screwed into the implants. It's more than enough to make you smile. To learn if your are a candidate for dental implants, schedule a consultation with Dr. Courey by calling 732-298-6551.